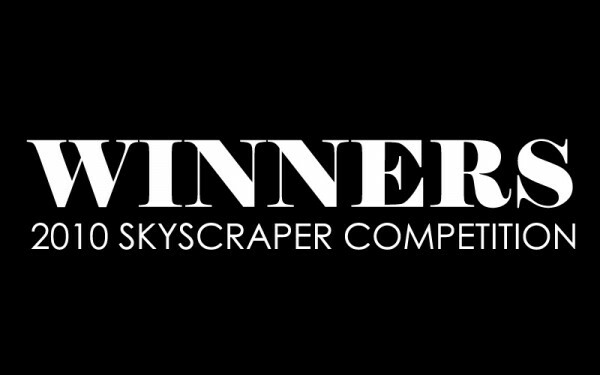 eVolo Magazine is pleased to announce the winners of the 2010 Skyscraper Competition. 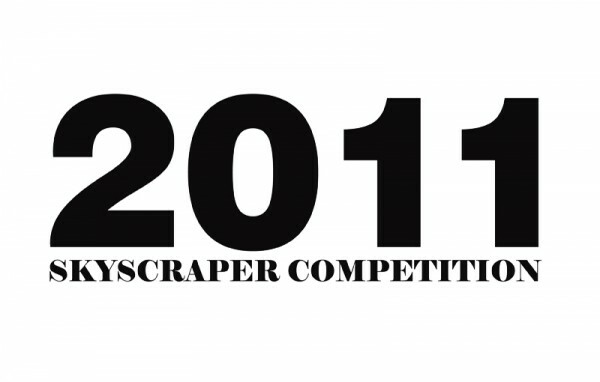 Established in 2006, the annual Skyscraper Competition recognizes outstanding ideas that redefine skyscraper design through the use of new technologies, materials, programs, aesthetics, and spatial organization. The award seeks to discover young talents whose ideas will change the way we understand architecture and its relationship with the natural and built environments. The Jury of the 2010 edition was formed by leaders of the architecture and design fields including: Mario Cipresso, Kyu Ho Chun, Kenta Fukunishi, Elie Gamburg, Mitchell Joachim, JaeYoung Lee, Adelaïde Marchi, Nicola Marchi and Eric Vergne. The Jury selected 3 winners and 27 special mentions among 430 entries from 42 countries. Globalization, sustainability, flexibility, adaptability, and the digital revolution, were some of the multi-layered elements taken into consideration. 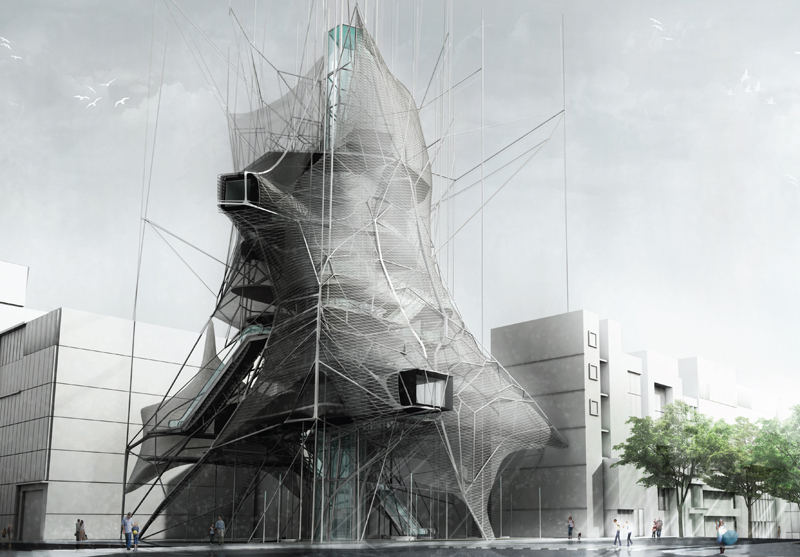 The first place was awarded to a project for a vertical prison designed by architecture students Chow Khoon Toong, Ong Tien Yee, and Beh Ssi Cze, from Malaysia. 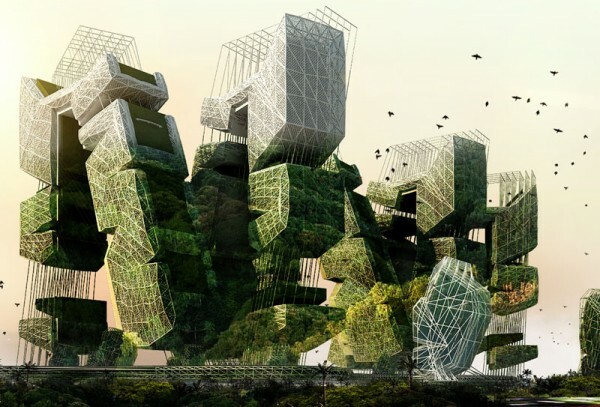 Their project examines the possibility of creating a prison-city in the sky, where the inmates would live in a “free” and productive community with agricultural fields and factories that would support the host city below. The recipients of the second place are Rezza Rahdian, Erwin Setiawan, Ayu Diah Shanti, and Leonardus Chrisnantyo, from Indonesia, whose project ‘Ciliwung Recovery Program’ aims to purify and repair the Ciliwung River habitat. The building is designed as an ingenious habitable machine that would collect garbage, purify water, and provide housing to thousands of people that live in the slums along the river. 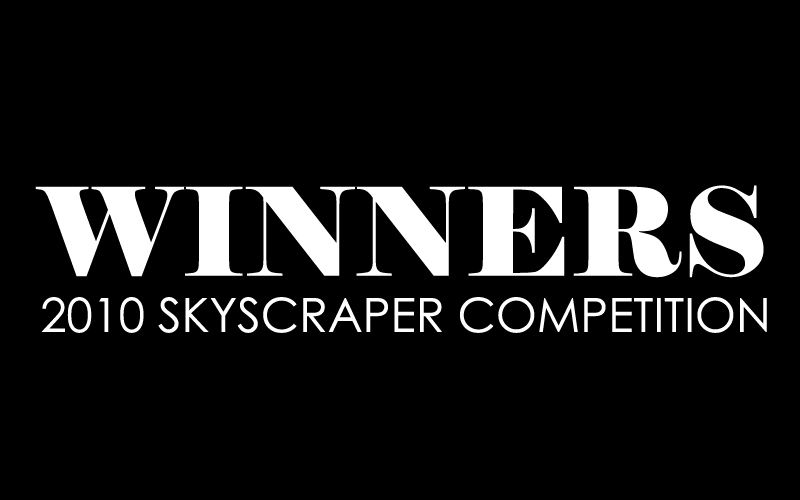 The third place was awarded to Ryohei Koike and Jarod Poenisch, from the United States, for their project ‘Nested Skyscraper’ that explores robotic construction techniques for a novel structure of carbon sleeves and fiber-laced concrete. The building is a system of multiple layers of composite louvers which thicken and rotate according to solar exposure, ventilation, and materials performance. Among the special mentions there are skyscrapers used as bridges that link different territories, cities in the sky powered by renewable energies, instant deployable buildings for disaster zones, skyscrapers that purify and desalinate sea water, or high-rises that commemorate historic dates. Other proposals create new pedestrian layers for existing cities. Some use the latest building technologies and parametric design to configure environmentally conscious self-sufficient buildings, while others create city-like buildings where different programs are mixed in one structure. eVolo Magazine would like to acknowledge all the competitors for their effort, vision, and passion for architectural innovation. Some studies reveal that post-release offenses are very high and that criminal’s imprisonment is just a temporal solution because they do not have the opportunity to rehabilitate in a desirable community. 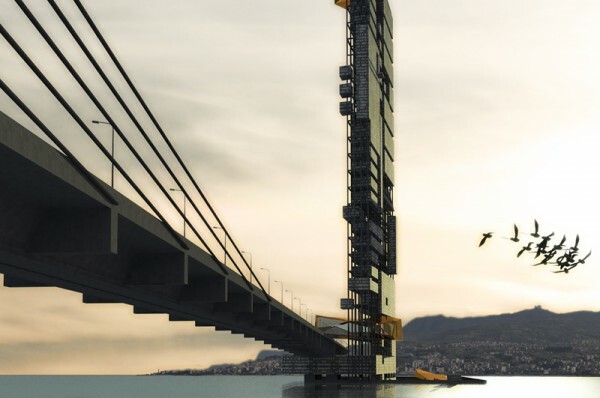 This project examines the possibility of creating a vertical prison in the sky where inmates will have to work and live in a community that will contribute to the host city below. The prison will have agricultural fields, factories, and recyclable plants that will be operated by the offenders as a way to give back to the community. They will live “free” until they have completed their sentence and are prepared to rejoin their communities. The city of Jakarta, Indonesia, was originally designed in the confluence of thirteen rivers which were used for transportation and agriculture. The largest of its rivers is The Ciliwung River, which has been extremely polluted during the last couple of decades, characterizes by hundreds of slums inhabited by thousands of people in marginal conditions. The Ciliwung Recovery Program (CRP) is a project that aims to collect the garbage of the riverbank and purify its water through an ingenious system of mega-filters that operate in three different phases. The first one separates the different types of garbage and utilizes the organic one to fertilize its soil. The second phase purifies the water by removing dangerous chemicals and adding important minerals to it. The clean water is then fed to the river and to the nearby agricultural fields through a system of capillary tubes. Finally in the third phase all the recyclable waste is processed. The Nested Skyscraper adapts to climatic, urban, and programmatic conditions with the use of advanced materials and robotic construction. 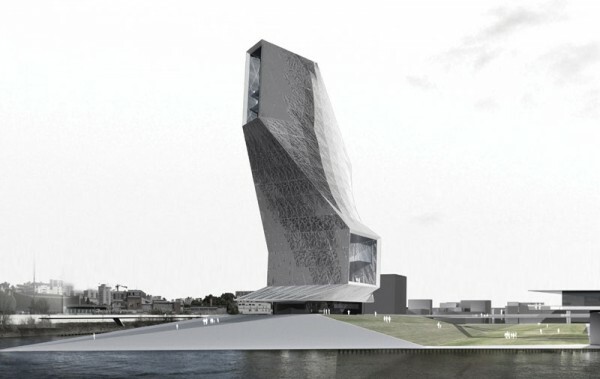 Its form and building method derive from the carbon sleeves and fiber-laced concrete performance. It is a composition of multiple layers of louvers which thicken and rotate according to solar and wind exposure. 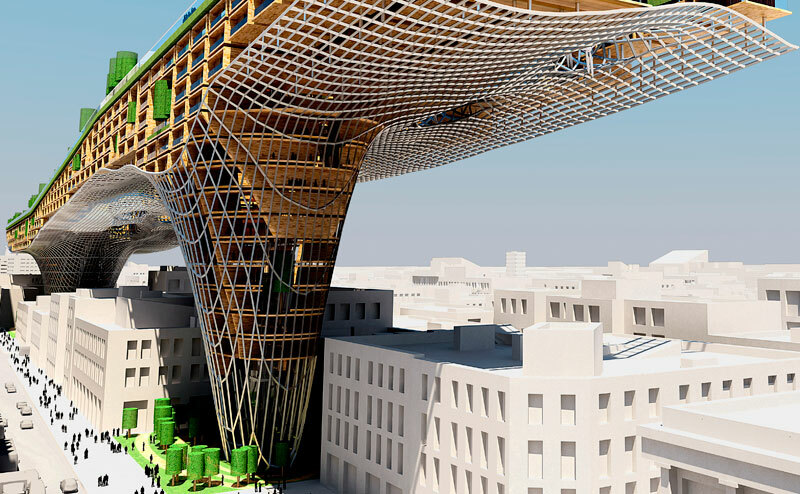 The construction method consists of a series of robots that stretch a network of carbon sleeves that are sprayed with fiber-laced concrete to create a primary structure. A second set of robots wraps the structure with a steel mesh for lateral movements and increase or decrease its density according to structural and programmatic needs. 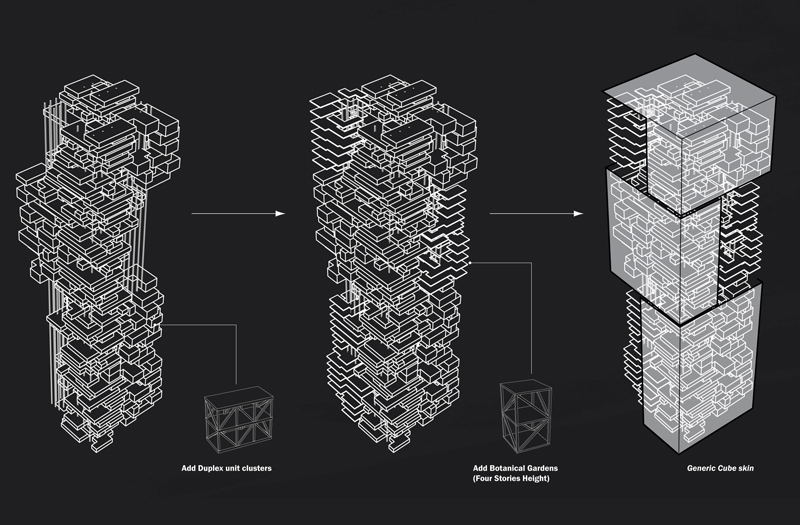 The resulting structure of “nests” is a hybrid of compressive and tensile elements that frees the skyscraper typology from the rigid multiplication of floor plates. Some of the inspirations for this project are the classical Chinese landscape paintings of the Lijiang River, the natural environment, and the culture and traditions of the local ethnic groups. 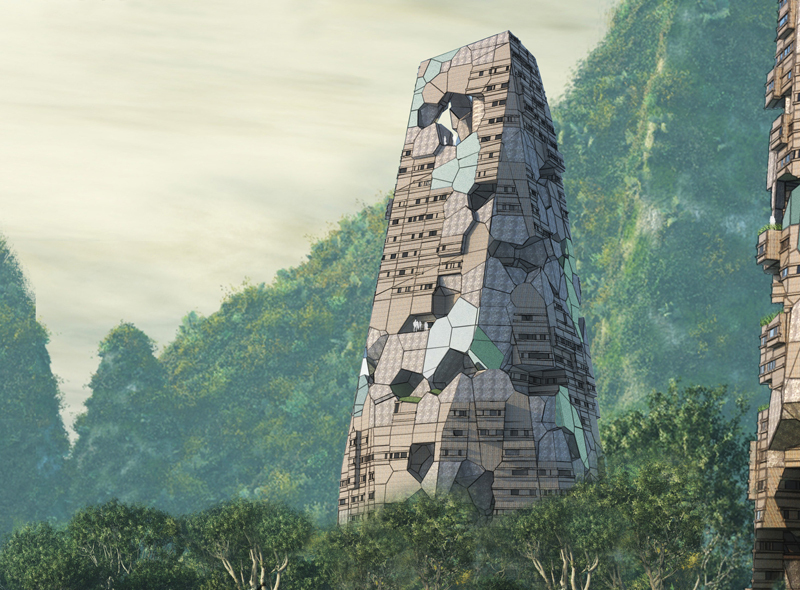 The main idea is to create sustainable towers for people seeking solitude and meditation. Among the different programs there are agricultural fields, terraces for meditation, housing, and recreational parks. 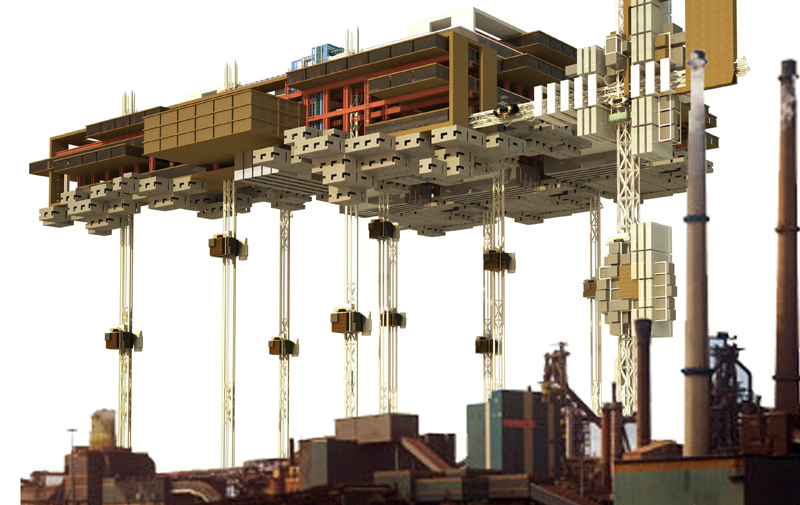 The Sky Table is a large horizontal building suspended above six blocks of an abandoned neighborhood of a generic city. Its primary structure is a steel mesh that peels into four colossal columns that connect to plazas and parks at street level. Due to its large scale and the variety of programs this proposal could be considered a city within a city where offices are located inside the pillars, housing is available in ten levels within the platform and recreational areas cover the entire roof level. One of the most discussed topics in Italian politics is the construction of a bridge over the Strait of Messina which will link Sicily to the main land. The shorter distance between the cities of Messina and Reggio Calabria is 3,150 meters and the average sea depth is between 80 and 120 meters. In 1968 the Italian Road and Motorway Network held a competition to design this bridge and the winning project “Future Metropolis of the Strait” by Alberto and Giuseppe Samoná considered both areas a single entity and proposed one city on both shores. Cities like Dubai and Seoul are developing hundreds of extravagant skyscrapers as way to express their economic prosperity and geopolitical power. Architecture has been transformed into a marketing tool for individuals, corporations, and countries in which, unfortunately, there is a lack of responsibility towards the existing urban fabric and the environment.